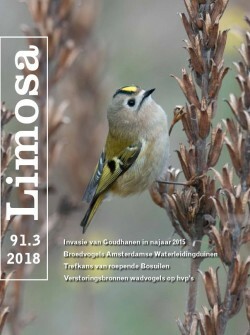 VAN DER SPEK V, SCHAAP L & EHRENBURG A (2018) Thirty years of breeding bird censuses in the Amsterdam Water Supply Dunes. LIMOSA 91 (3): 108-122. The Amsterdam Water Supply Dunes (Amsterdamse Waterleidingduinen, AWD) along the Dutch west coast have been systematically monitored for territorial birds since the start of the nationwide breeding bird monitoring project in 1984. Many species associated with shrubs and forests increased in 1984-2015, while most species of more open areas decreased. In general, species on the national Red List declined or disappeared altogether, whereas already common species increased. The number of nonnative species increased slightly over time. Though the methodology differed considerably, breeding bird surveys in the 1970s give an insight in population trends at that time. The annual number of breeding species decreased from c. 90 in the 1970s to 68-83 (average 75) in 1984-2015. Within the 1984-2015 period there was no clear trend in species diversity, though after 2000 there seem to be slightly more species-poor years than before. Though it is widely believed by birdwatchers that the decline in diversity and the disappearance of characteristic species of the dunes is a fairly recent phenomenon, most species that have disappeared or become very rare already decreased in the 1970s, and seven species disappeared in the early 1980s. The vast majority of these trends are not specific to the AWD, but take place throughout the Dutch dune region, nationwide or even internationally. Important causes for the changes are likely (1) habitat change, with an increase in area of forest and shrub and a decline of open areas, induced by a wide range of causes including diminished Rabbit populations and ongoing Nitrogen deposition, (2) improvement of water quality, which had a large effect on the formerly eutrophic marshes, (3) the arrival of larger predators (e.g. recolonization by Red Fox caused the exodus of large ground-breeding species like gulls, while the colonization by Goshawk and Common Buzzard and (earlier) Tawny Owl affected smaller raptors and owls and several prey species like some woodpeckers and corvids), (4) recent overgrazing by an increasing population of introduced Fallow Deer (affecting at least Common Nightingale). National and international developments may partly explain why many bird species did not benefit from site management (particularly in the open dune habitats), whereas other species groups did. Fortunately there is also some positive news: nationally scarce species like Red-crested Pochard, Eurasian Bittern and European Honey Buzzard have settled recently and formerly scarce or declining species like Wood Lark and Common Redstart have increased or recovered substantially.